Let’s face it – there are some people on the river who regard locks as an interruption to their day – an annoying waste of time when they could be charging along the river in their gin palaces, breaking the speed limit and causing a good deal of nuisance. I suspect these are probably the same people who drive at 100mph along motorways in their big German cars leaving approximately two feet between them and the car in front. (Sorry – my prejudices are showing!) My view on locks is somewhat different – they are an opportunity to take a break, have a chat with other skippers and generally to enjoy the whole process of winding down and abandoning the need to rush around that daily life normally requires. But the other important thing about locks is the love and care that lock keepers and their staff lavish on them. All along our stretch of the Thames, locks are characterised by beautifully tended and colourful flowerbeds and immaculately mown lawns. None more so than Shepperton Lock, whose keeper, Steve Newman, has just picked up the award, sponsored by Brett Associates, for the best-presented lock on the Thames for the second year in a row. After being presented with the award, Steve said: ” A big thank you to all those who voted for Shepperton – the recognition makes all the hard work of myself and the team worthwhile. Matt Carter, Waterways Operations Manager at the Environment Agency, said: “These awards give members of the public an excellent chance to let us know how we are doing on the River Thames. Congratulations to Steve and his team for all their hard work. Next time you pass through Shepperton Lock, take the time to look around and appreciate what they’ve achieved. THE Tall Ships will be back in London this summer to give folk another chance to see – and maybe to sail – these lovely craft. The Tall Ships fleet was here for the Olympics last year and will return to Greenwich from August 28 to September 1. 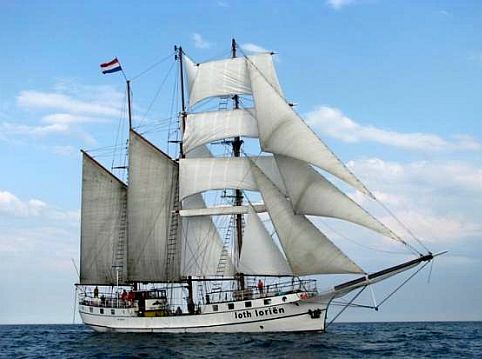 Among the sailing ships already definitely attending will be the three-masted schooner Loth Lorien, the brig Morgenster, the topsail schooner Gulden Leeuw and the gaff topsail schooner J R Tolkien. More details on the website: www.sailroyalgreenwich.co.uk. A WORD of warning to those who break the speed limit on the Thames – the Environment Agency are cracking down on speedsters this year. Agency patrols on the river will be equipped with speed guns and they will be targeting those lovely people I mentioned earlier who hammer along creating destructive wash and causing problems for small craft. The speed limit on the upper reaches of the river is 8km per hour. Stick to it.